Thanksgiving is a time for family, food, and football. But what is it really about? Thanksgiving, at its core, is about the quest for a Christian colony and God’s providence. Imagine not having a Bible. It was only about 500 years ago there was a scramble to get the word of God into the hands of the people. In the 14th century John Wycliffe translated the Latin Vulgate, Martin Luther nailed his Ninety-five Theses to the Wittenburg door in 1517, and around 1525 William Tyndale translated a Bible the from Greek texts. In 1534, King Henry VIII allowed for the Miles Coverdale Bible to be distributed. This Bible was based on previous translations (primarily Tyndale’s) and not on the Greek or Hebrew texts. The circulation of this Bible and others caused greater demand for an authorized Bible. By 1560, the British Puritans translated the Geneva Bible from early Greek and Hebrew texts. The Puritans hoped to see a more “pure” church. They wanted to see more reform in the church. Reform came at a price. In 1564, John Hus was burned at the stake for preaching to thousands of people and defying church hierarchy. In 1606, the Puritans wanted to start their own church. They held that the true church must submit to the headship of Christ (and not the earthly King). So, they asked permission to begin their own church. King James denied their request. So, the Puritan Pilgrims moved to Holland in hopes of experiencing religious freedom. They spent about ten years in Holland. Talk began of a Christian colony. By 1611, King James authorized a translation of the Bible. Fifty-four scholars from Oxford, Cambridge, and Westminster aided in this translation. In 1617, after reading the text “You are the light of the world” (Mt. 5), the Pilgrim congregation was moved to advance the gospel, and they voted to leave Holland. By August of 1620, the Pilgrims obtained a passport from the King to form a colony in Virginia. There were two ships that set out to Virginia originally—the Mayflower and the Speedwell. The Speedwell began to leak on the voyage and was later deemed unseaworthy. By September 6, 1620, the Mayflower, with 102 passengers and thirty crew, packed the ninety-foot ship. After sixty-six days of stormy weather they were blown well off course. They sighted land and dropped anchor at the tip of Cape Cod. Ten days later, December 21, 1620, the Pilgrims landed at Plymouth Rock. The quest for a Christian colony was costly. Fifty-one people died in the harsh winter of that year. However, God was providential. When they landed, God provided them a land that had been abandoned due to a plague in the native-American tribe. Because of this, they were free to settle there without fear of the territorial tribe attacking. By March of 1621, God provided an English-speaking native-American named Squanto to teach the Pilgrims to hunt, fish, and harvest edible plants. The story of Squanto is integral to the story of God’s providence. Squanto had been kidnapped several years prior to the Pilgrims landing in America. He was brought to Spain and England. In time, he was taught English by monks. Eventually, he escaped and he was able to make his way back to his village in America–the abandoned village that was wiped out by plague. If Squanto had not been kidnapped, it is likely that he would have died by plague and the Pilgrims would not have benefited from his ability to speak English. Squanto was also integral in being a liaison with Chief Massasoit’s tribe. By October of 1621, it was harvest time. Chief Massasoit and ninety in his tribe feasted together with the Pilgrims for three days. This was the first Thanksgiving. The Pilgrims were grateful that Massasoit’s tribe helped them to survive and Massasoit’s tribe was grateful the Pilgrims assisted them in fending off a neighboring tribe. The Pilgrims may have seen themselves as being similar to the Children of Israel. The Children of Israel crossed the Red Sea and the Pilgrims crossed the open ocean. The Children of Israel were cast into the wilderness with no home or hotel. The Pilgrims initially built seven dwellings but they dug fifty-one graves. God pointed the Children of Israel to manna and water and God gave the Pilgrims Squanto. The Pilgrims felt lead by the hand of God much like the cloud and pillars of fire that lead the Children of Israel. The Children of Israel and the Pilgrims were seeking a land of promise. What are you thankful for this Thanksgiving? The Pilgrims risked everything to gain what was most dear to their heart—religious freedom. I am grateful for them. 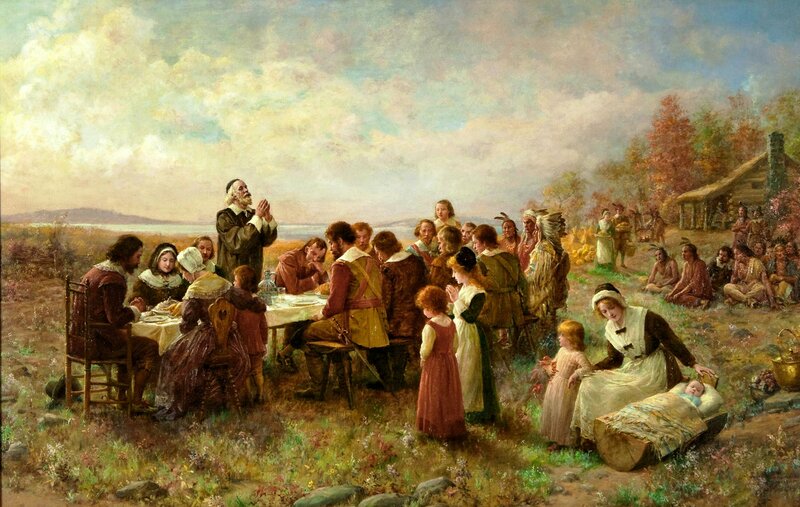 *Photo “The First Thanksgiving.” Copyright Pilgrim Hall Museum. It may be purchased here.